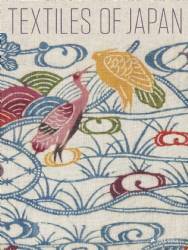 Detailed photographs and descriptions of a diverse assortment of Japanese fabrics from the late 18th to early 20th century. The book intimately relates a huge span of work, from the indigo-dyed cotton of the main islands of Honshu and Kyushu, to the bark cloth, nettle fiber, and fish skin robes of the aboriginal Ainu in Hokkaido and Sakhalin to the north. 520 pp. Thomas Murray and Virginia Soenksen.